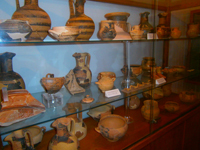 The Archeological Museum of Naxos houses works of art and objects of every day use dating from the Late Neolithic period to Early Christian times (5300 BC - 5th c. AD). 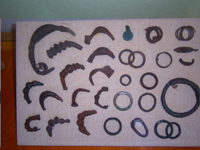 These finds came to light in the excavations which have been continuing on the island since the Second World War. Naxos is the largest and most important of the Cyclades, a rich island with a natural environment suitable for the development of farming and stock-raising. It is also an island with good natural harbors, a circumstance which has contributed much to its strong continuous cultural presence in Greece from the end of the 4th millennium BC to the present day. Naxos first flourished during Early Cycladic II period (about 2700 - 2300 BC), during which, along with the small nearby islets, it evolved into one of the most important commercial and cultural centers of the period. During the later phases of the Bronze Age, there were a variety of changes and upheavals in the Aegean which resulted in new centers rising to prominence on other islands (Thera, Milos, Paros) and Naxos lost its leading position in the Aegean. 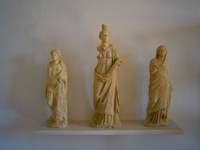 The Archaeological Museum building, which has been declared a historical monument, was built in the period from 1600 to 1800, and is an impressive example of the architecture that developed on Naxos at the time of the island's prosperity during Frankish period. It is a five-storey structure and was built on the course of the Frankish fortification wall, incorporating two of the towers. It was designed to house a school of Jesuits, founded in the 17th c., and ultimately, in the late 19th c. - early 20th c., housed the famous commercial school, one of the pupils at which was Nikos Kazantzakis. 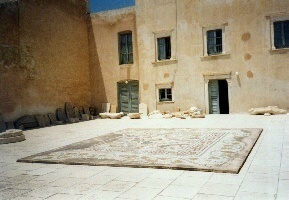 It was later made over to the Archaeological Service and has been used to house the Museum since 1973. Clay rhyton (ritual vase for libations) of animal shape. Dated to the Early Cycladic period (3200-2300 BC). Marble vase. Dated to the Early Cycladic period (3200-2300 BC). 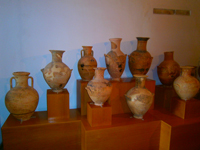 Early cycladic vases from the island of Epano Koufonisi (first half of the 3rd millennium BC). 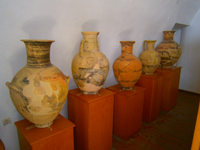 Early Cycladic vases decorated with incised decoration from the islands of Epano and Kato Koufonisi (3200-2300 BC). 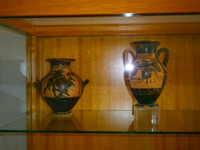 Early Cycladic pyxis of marble and schist from the cemetery at Aplomata (2800-2300 BC). Early Cycladic marble figurine from Keros (2800-2300 BC). Mycenaean stirrup jar from the chamber tomb cemetery at Aplomata decorated after the octopus style (12th century BC). Mycenaean strainer hydria (jug) from the chamber tomb cemetery at Kamini decorated with a scene of circular dance (12th century BC). Four gold plaques from a rich child burial at the cemetery at Kamini depicting the dead child. Dated to the Late Mycenaean period (12th century BC). Geometric amphora dated to the first half of the 8th century BC. Gold jewellery from cist tombs at Tsikalario and Chora dated to the Geometric period (9th-8th century BC). Torso of a naxian kouros. Dated to the second half of the 6th century BC. 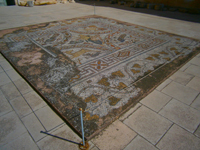 Detail of a mosaic floor from Aplomata depicting a Nereid on a bull. Dated to the roman period.